F is for The Falls. 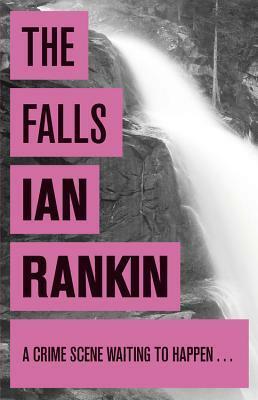 I first wrote about The Falls by Ian Rankin last March. Since then I have watched the TV version which was very different. I wonder why I bother to watch dramatised versions after I’ve read a book because they very rarely live up to my expectations and this version was particularly bad because it completely changed the story. Instead of investigating the disappearance of university student Philippa Balfour, known as ‘Flip’ to her friends and family, the TV version starts when a retired doctor gets killed in his home, tied to a chair, his wrists slit, bleeding to death. The book is so much better. DI Rebus and his colleagues have just two leads to go on – a carved wooden doll found in a tiny coffin at The Falls, Flip’s home village and an Internet game involving solving cryptic clues. Rebus concentrates on the tiny coffin and finds a whole series of them have turned up over the years dating back to 1836 when 17 were found on Arthur’s Seat, the extinct volcano within Holyrood Park, east of Edinburgh Castle. DC Siobhan Clarke meanwhile tries to solve the cryptic clues. There are many things I liked about this book – the the interwoven plots, throwing up several suspects; the historical references to Burke and Hare, the 19th century resurrectionists; the spiky relationship between Rebus and his new boss Gill Templeton; Siobhan Clarke whose liking for doing things independently matches Rebus’s own maverick ways; and above all the setting in and around Edinburgh. All the way through I kept changing my mind about ‘who did it’ and it was only just before the denouement that I worked it out. You wonder sometimes whether the TV version of a book is based on the same one that you read, don’t you? I remember enjoying The Falls Margaret. Thanks for taking part in the meme. I remember reading your review for The Falls. I have to check it out! Here is my Crime Fiction Alphabet: F post! It’s sad when the producers or screenwriters or whomever changes a favorite story. I often wonder – do they just want the title of the book to attract viewers? If a book is good, stick to the plot. This book sounds good. Now I know to steer clear of that dramatization. That is such a shame, I thought The Falls was particularly good.